The Cuisinart Toaster Oven Broiler is a Deluxe Convection Toaster Oven Broiler that has 9 functions, including convection, to handle your family’s cooking needs. You can bake delicious cakes, roast potatoes, and crisp juicy roasts with this kitchen workhorse. With 0.6 cubic foot capacity, the Toaster Oven fits a whole chicken, a 12-inch pizza, or 6 slices of bread, and is conveniently controlled by an electronic dial and LED buttons. The Exact Heat™ sensor maintains precise temperatures, and the Always Even shade control ensures toast will meet your family’s tastes. 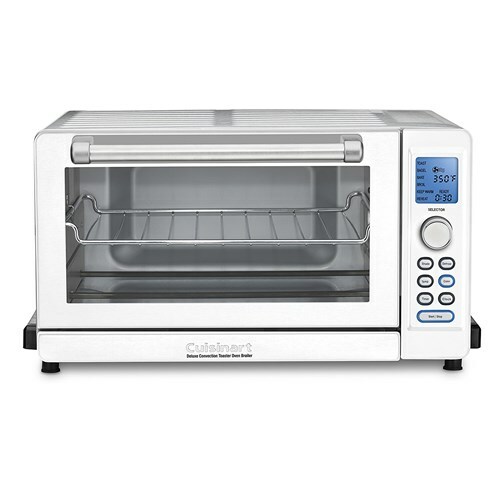 The Cuisinart Deluxe Convection Toaster Oven Broiler has many exciting features for users of all types. You can extend the lifetime of your Cuisinart Deluxe Convection Toaster Oven Broiler with the purchase of a FactoryOutletStore Factory Protection Plan. See the Cuisinart Deluxe Convection Toaster Oven Broiler gallery images above for more product views. 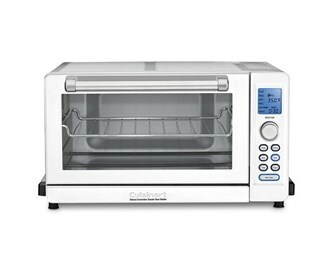 The Cuisinart Deluxe Convection Toaster Oven Broiler is sold as a Brand New Unopened Item.